SpaceX lifted Bangladesh's first satellite into orbit Friday using an upgraded rocket designed for dozens of repeat flights including back-to-back, same-day launches. SpaceX chief executive Elon Musk said launching the same rocket twice within 24 hours will be "crazy hard," but he hopes to pull off the feat as early as next year. This latest and final version of the company's Falcon 9 rocket—capable of more than 10 reflights, possibly even 100—made its debut Friday. It soared from NASA's Kennedy Space Center into a hazy afternoon sky, carrying a communication satellite named Bangabandhu-1 after the founding father of Bangladesh. A last-minute abort halted Thursday's try. 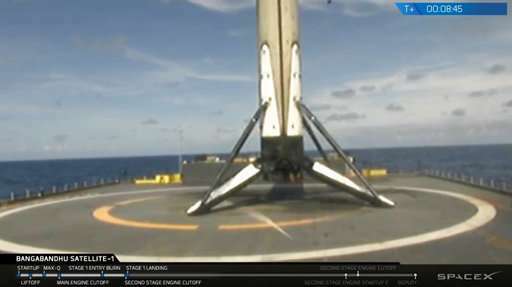 This newest booster landed on an ocean platform following liftoff as planned. "What a great sight!" the launch commentator announced as cheers and applause filled SpaceX Mission Control in Hawthorne, California. The booster will be taken apart for analysis before flying again in a few months. Musk's goal is to eventually have little if any prep work between launches. The whole point of reusability—multiple flights with swift turnarounds, airplane-style—is to shave launch costs. "This is a ridiculously hard thing," Musk told reporters before Thursday's postponement. "It has taken us ... 16 years of extreme effort and many, many iterations and thousands of small but important development changes to get to where we think this is even possible. Crazy hard. We still need to demonstrate it. It's not like we've done it. But it can be done." The Falcon 9 is SpaceX's workhorse, regularly hauling satellites into orbit and supplies to the International Space Station. This new and improved model will be used to launch astronauts for NASA in the coming year. So far, the first-stage boosters have been recycled once, for a total of two flights apiece. There has been a fair amount of maintenance between uses. For this new model, SpaceX enhanced engine performance, strengthened various parts of the rocket and improved the landing gear system. In the most visible change, the segment between the first and upper stages went from white to black with the addition of new thermal insulation. Musk wants to ultimately recover the entire rocket, not just the first stage, which accounts for 60 percent of the cost. He expects more customers to start gravitating toward "flight-proven" rockets as he calls them. "Would you rather fly in an aircraft that has never had a test flight before or would you rather fly in an aircraft that has flown many times successfully?" he said. Musk plans to launch about 30 of these upgraded Falcon 9s before switching to a massive rocket still in development known as the BFR, or Big Falcon Rocket. Capable of launching spacecraft to Mars—Musk's ultimate ambition is to colonize the red planet—the BFR will replace not only the Falcon 9, but the brawny Falcon Heavy. The Heavy debuted in February, launching Musk's Tesla electric sports car toward the orbit of Mars. Bangladesh, meanwhile, was thrilled to have its own satellite to spread internet throughout the land and provide emergency services in case of natural disasters. Mohammad Ziauddin, Bangladesh's ambassador to the U.S., called it a historic occasion and a matter of great pride for his country's citizens.